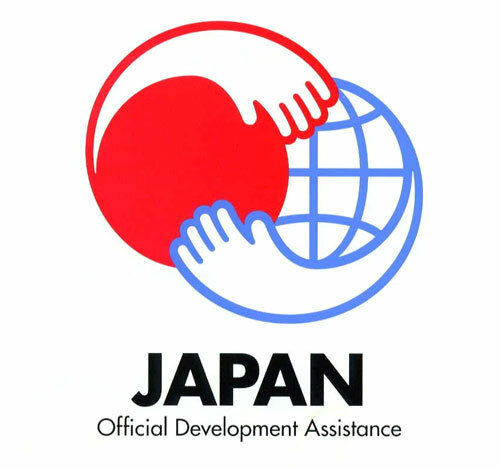 The Hinomaru (Japanese National flag) and the ODA logo have become established as the symbols of assistance provided through Japan's ODA. They are attached to structures built and goods supplied through Japan's ODA and are helping to increase the "visibility of Japanese aid." The Hinomaru is one of the most effective methods of showing that the assistance came from Japan, and as such it is useful for increasing the "visibility of Japanese aid." The design of the ODA logo was decided on in September 1995 from among 5,000 designs submitted by the public. The design features a red circle suggesting the Hinomaru of Japan on its left side and a blue circle suggesting the earth on its right side, and the two hands are reaching out to embrace each other. Currently Japan is providing ODA to more than 160 countries and regions around the world. The Hinomaru and ODA logo stickers attached to the goods and other items provided through ODA are not only in English, but also in French, Spanish, Arabic, and Portuguese. They publicize the assistance provided through the ODA of Japan within the recipient countries. 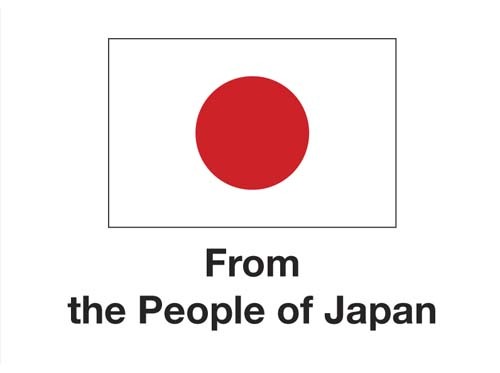 A sticker featuringthe Japanese flag and the words "From the People of Japan"